My Fujix DS-565 (also known as Nikon E3S) was bought on eBay in May 2005 for $235. It arrived safely after more than a week in customs (after all, it is a suspicious looking camera). Not as nice as my E2N bought a month earlier (which is like brand new), but still in very good shape. I only got the camera body (incl. battery) this time - no charger, manual, memory card or other goodies. The E3/E3S cameras were announced in 1998, and features a 1.4 megapixel CCD (1280x1000 pixels) with the same field of view as a 35mm camera. Again, Nikon teamed up with Fujifilm, explaining why identical cameras were sold both under the Nikon and Fujifilm brand. In most aspects, the E3 models are similar to the previous E2 models (big and bulky), so I won't spend much time repeating physical features and technical details. Instead, I'll simply give a few first impressions, and let the photos speak for themselves. Eager to test the camera, I quickly discovered that the EH-1 Nikon charger (for the older E2 models) does not work with this camera. Physically, the batteries are identical, but the charger plug is not. The E3 models uses a newer and better Ni-MH battery, which is probably the reason why the charger is different. Fortunately, I could use the battery (or AC adapter) from my E2N to get my 'new' camera operational. After reading a tip on the excellent Vintage Nikon DSLR forum, I also found out that the E3 Ni-Cd battery can be charged using the original Nikon D1 chargers (MH-15 and MH-16). 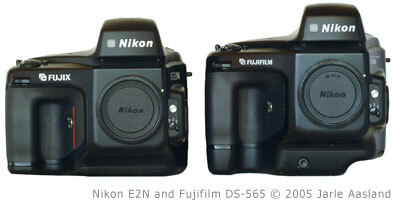 Strange but true: The E3 was first available only a few months prior to Nikon announcing their first 'real' DSLR: The D1. Technically, the E-cameras are real enough - but for many reasons they never sold very well. In retrospect, it's tempting to describe them as 'public prototypes' or 'beta versions' of better things to come. Compared to the older E2 bodies, camera ergonomics has been improved (or at least changed), but at first glance both cameras looks more or less identical. The E3 is slightly taller, includes an additional SCSI connection on the back (covered by a very robust rubber cover which is secured by two screws), and a CSM and BKT button. It also includes GPS support (a first?) and other improvements. The fastest aperture is now f/4.8, compared to f/6.7 (?) on the E2N. As usual, my DS-565/E3S has a very low serial number: 8300032. All E-models I've seen so far have these xx000xx serial numbers, except for one: E2N no. 7100103. As usual with older DSLR's, the E3 requires an ATA PCMCIA memory card. I mounted my one and only 40 MB ATA PCMCIA flash card and fired away. This camera is definitely much faster than my E2N: It can shoot an amazing 3 fps for up to 12 frames! 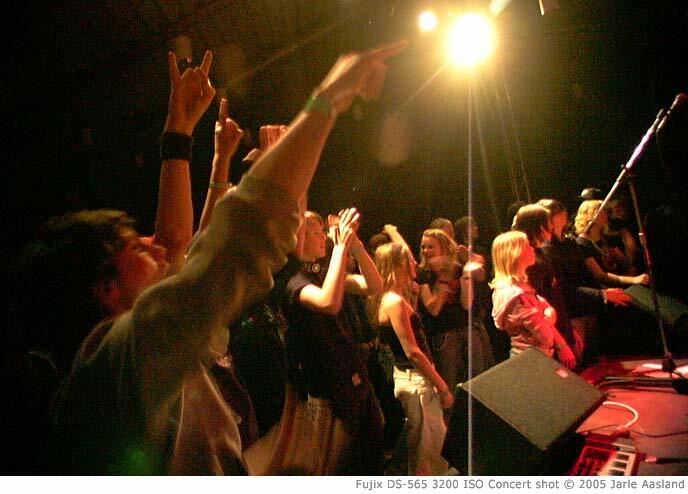 Deciding to test the camera under real conditions, I brought the vintage DS-565 to a rock concert, alongside with my D2X! Working in low light, I used ISO 3200 and a manual focus 20mm f/2.8 (effectively becoming f/4.8 due to the Optical Reducer). The camera is fast and responsive, but lacking a LCD monitor I was unable to check exposure as I captured my 325 KB JPEG's (!). Having worked with film bodies for many years, this shouldn't be a problem, but I still found myself constantly looking at the camera back. 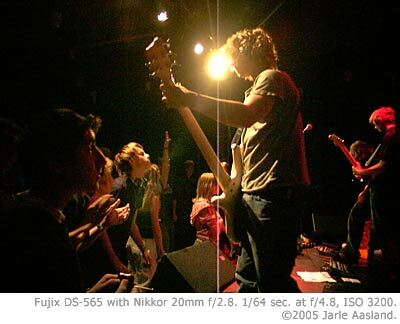 Once you're accustomed to the instant feedback of modern digital cameras, it's hard to go back.. I didn't shoot more than 30 frames or so at the concert (compared to almost 1000 with the D2X), but as far as I can tell image quality is the same as with the older E2N. I don't think anyone would see any difference between photos from these two models. With 800 being the lowest ISO setting, I personally think that the E-cameras works best under low-light conditions. 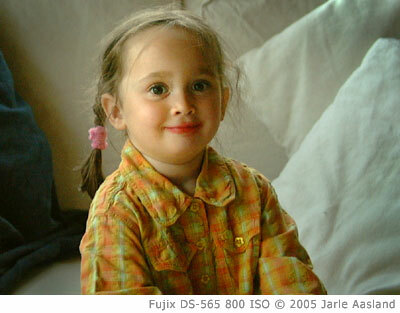 In bright daylight, the E-models simply cannot compete with lower ISO shots from newer cameras (or Kodak DSLR's from the same period). 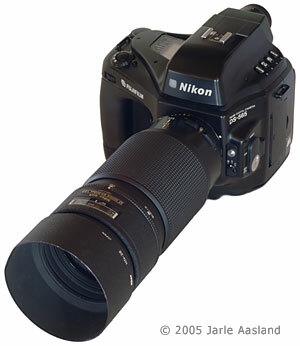 Also, the Optical Reducer System will decrease image quality. Still, I'm quite pleased with the high ISO/low light results from the E2 and E3 cameras. They're noisy (especially when underexposed), but still usable. For newsprint and small web use they're almost as good as those from a modern camera. That being said, the old Nikon/Fujifilm E/DS models cannot compete with a modern DSLR like the D2X (or a D1 or D100, for that matter). If you plan to buy and use one of these (thinking it's "probably good enough"), there's a good chance you will be disappointed. That's probably the reason many of these cameras are sold over and over again on eBay. I don't want to repeat lots of technical data and info that can be easily found elsewhere. For more info on the E3S and other Nikon cameras (both film and digital), visit the excellent Photography in Malaysia website or www.nikonlinks.com. 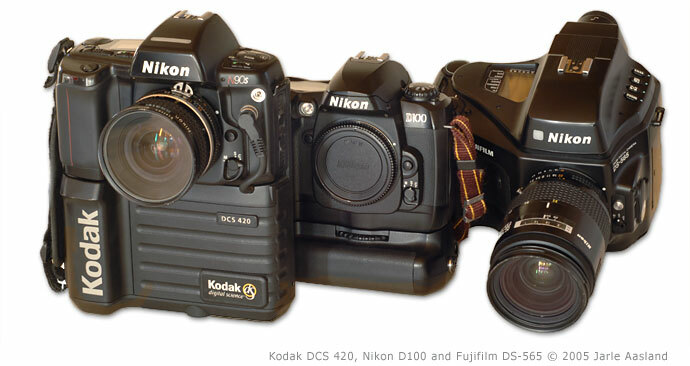 For even more digital nostalgia, take a look at my Nikon E2N and Kodak DCS 420 reviews, and Eamon Hickey's great article on the Kodak NC2000.